The only thing worse than a long stressful week at the lake is a boat that won’t start. Keeping your boat batteries healthy and fully charged will allow you to start the engine and power vital accessories for that joyful ride. Luckily for you, there are lots of marine chargers available in the market today. What Charger Options Do You Have? 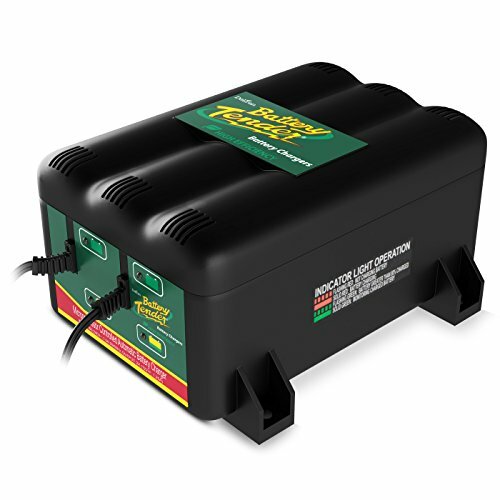 Generally, there are two main types of boat battery chargers: On-board and Portable. On-board chargers allow you to leave the battery in the boat and are a good companion for your fishing pursuits. They are digitally controlled and automatically adjust the charging rate as the batteries charge, protecting them from damage due to overcharging. You can also add an extra boost in the charger efficiency by installing an alternator charger which considerably improves the battery life. Portable chargers, on the other hand, allow you to take the action right to your boat with their portability feature. They are also digitally controlled for precision charging to keep your batteries healthy. They also come with an automatic temperature compensator that protects your batteries from overheating as they charge. Marine battery chargers vary in size, amperage, and the number of banks required. If, for example, you own a large marine vessel, you would need more power to keep your boat running. To keep all batteries sufficiently charged, you need at least one bank for each battery including the starting battery. As a good rule of thumb, the ideal charger should match the total sum of DC loads and have an extra 10% of the battery amperage. Knowing more about your specific battery specifications will help you make a better choice of your charger. With that said, you should watch out for such specs as input voltage, battery type, and charge. These will help you choose a charger that does not overcharge your batteries. More importantly, it will come in handy in the estimation of the charging time. Large batteries usually require more time to charge to full capacity. To determine the total charging time, simply divide the ampere-hour rating of the battery by the charger rating and then add an extra 10% time to allow full top-off. What Are The Various Battery Types Available? Different boat batteries require different charging modes to ensure safety and efficiency. Basically, there are three main options available: Gel, AGM, and Flooded (wet cells). Gel batteries have a narrow charging profile and usually require precise and regulated charging to prevent damage. Though expensive, they are highly efficient in terms of power draining and usually support smart charging. The AGM type adopts a more rugged design and usually requires very little or no maintenance. They are more tolerant to shocks and vibrations and are by far the more popular marine cells. Though they are still sensitive to overcharging, AGM batteries offer a good standard in terms of the rating and performance when choosing a boat battery. Unlike the other types, wet cells allow hydrogen venting since they are not sealed. This means that they are less sensitive to overcharging. They do, however, require some maintenance especially during off-seasons. Choosing a battery charger that features an automatic maintenance mode would be a wise choice if your boat uses flooded batteries. Depending on the construction, every battery charges fastest and most efficiently when following the Ideal Charge curve, a graphical model that shows the charging process in stages. Basically, the curve has 3 phases: the bulk phase, the acceptance phase, and the float phase. In the bulk phase, charging process takes on a hurtling mode, charging at a rate of up to 40%. This is made particularly possible because the battery is more “power hungry” when discharged and accepts more current. This usually builds the charge to about 75% of full charge. In the acceptance phase, the amperage is steadily reduced and the cell charges at a declining rate. This phase advances to the float phase where the battery charge is maintained to prevent drainage. To prevent overcharging, an equalization phase is added to force the battery to full capacity without boiling the electrolyte. How Can You Extend Your Battery Life? A common mistake made by most boat users is deeply discharging the cells and using powerful chargers to bring them back to life. To extend the life of your batteries, one of the most effective routines to adopt is charging them before storage. Leaving them discharged causes corrosion and reduces their ability to store charge. Again, allowing the cells to charge sufficiently, without overcharging or undercharging them, prevents sulfation and thermal runaway, improving their efficiency and performance greatly. Avoid mixing your old cells with newer ones and where possible, use shallow discharges to recharge them. Charging in series is usually preferred to parallel charging as it offers a more balanced experience, thus improving the life of the cells. 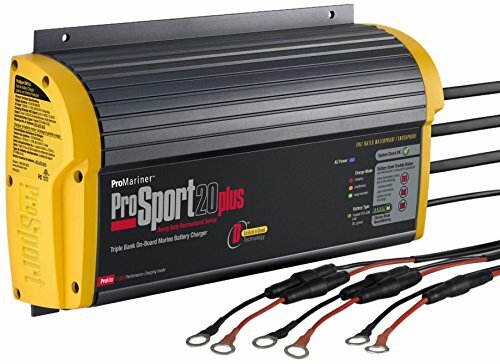 The ProMariner 43012 ProSport is a superior value option 3-bank battery charger that uses distributed-on-demand technology to ensure all your boat cells are always juiced up. This ensures that all excess power is distributed to other house bank batteries (if any) and the trolling motor. The charger constantly monitors the power levels and battery condition and gives instant feedback to allow you to keep the health of the cells in check. 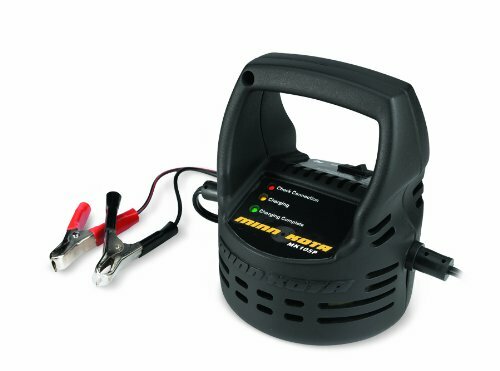 Along with the many safety and efficiency features that come with the unit such as inline fuses, temperature sensors, voltage overload regulators, and a reverse polarity feature, the charger is highly compatible with both flooded and AGM batteries, making it an ideal choice for anyone looking to add some value in their charging operations. 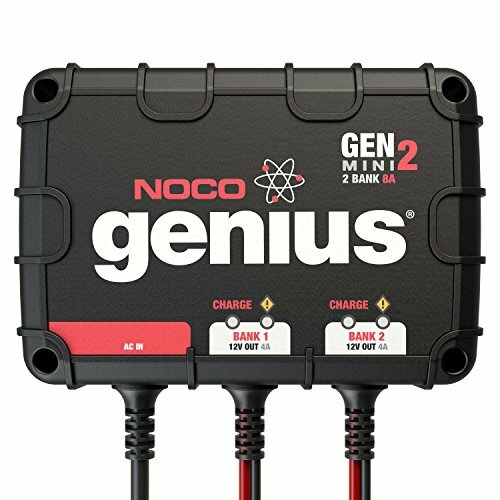 NOCO Genius is a popular brand in both the marine and automotive industry. Even with the third generation out, the Genius GEN2 continues to thrive, mainly because it’s compatible with a wide range of battery types including AGM, Gel, MF, and wet models. The charger is mainly designed for 12V batteries and works well with cells ranging from 20Ah – 120Ah. There are also some creative safety features that prevent short circuits, reverse hook-ups, sparking, and overheating. A pulse charging feature adds some functionality to the charger by allowing charging of sulfated or almost-dead cells. 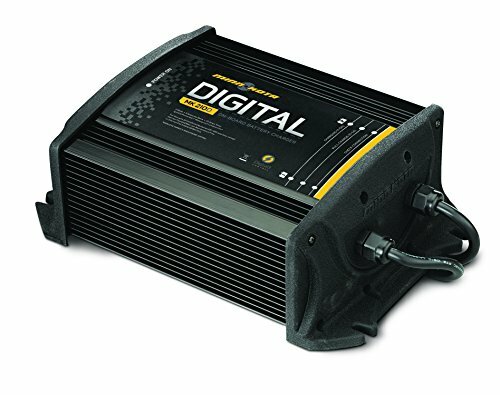 The Minn Kota On-Board Digital Charger is a sophisticated gizmo which offers excellent efficiency in small-sized marine vessels with its fast-charging feature. It uses multistage charging to allow the battery to build up a charge serially. A temperature sensor is fitted to monitor the process and protect the cells from overcharging and overheating. With a 10 amp capability, the charger is highly resistant to corrosion and works perfectly even in salty water. The Battery Tender 022-0165-DL-WH is a sealed, maintenance-free charging unit that comes with two separate charging stations. It finds a wide application in automotive powering, gardening equipment, and marine battery charging. The charger is fitted with many safety features, from the rugged construction to the technical protection mechanisms. With its dual-bank battery tender, the charger supplies a consistent flow of charge to ensure that all the cells remain in their best condition. There is also a reverse protection and spark proof features to add to its already sophisticated safety measures. At the low end of the price spectrum, the MinnKota MK-105P Portable Battery Charger offers a good compromise between price and functionality. Being a portable unit, the 1-bank, 5 amp charger adopts a compact lightweight design and can charge both 6V and 12V batteries. It runs on a two-stage charging system and is highly efficient in optimizing the charging process. You will also love the safety mechanism including overcharging and reverse polarity protection. And if you want to track the charging process, the LED indicators on the housing are there to keep watch. Like any other product, the key to buying the best marine battery charger for your boat is understanding your specific needs. By now, I’m sure you already have a good selection of options to get started. Consider the size of your vessel, the number of banks needed to sufficiently charge all the batteries, and the types of batteries you want to charge. These will go a long way in helping you choose the best charger for your boating needs.